After creating the 3D Scene with Models, Shader, Lights & Animation there is often just one thing missing, render elements. Most of them are working straight from Vray, but to create nice and more important, constant Multi Matte elements you have to assign a lot of ids to your objects by hand. To get rid of this painful task, I wrote this small tool set. With the help of this script, you can easily Assign IDs and create Vray Multi Mattes with just a few clicks. 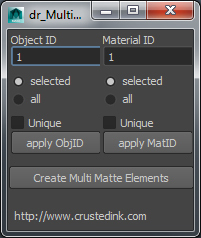 “Create Multi Matte Element” will create Vray RenderElements for all IDs in the current Scene. still waiting for the confirmation from creative crash, but in the meantime you can dowload it here.